This is a mandala in the Catholic Parish Church of Saint Hubert in Aubel, Belgium. It was built between 1907 and 1910. The photo was taken by Wikimedia commons contributor GFreihalter. I am using it under the creative commons attribution-sharealike 3.0 unported license. I have modified the original image to remove some of the distortion. I also made some minor repairs to the window. If you have been reading my blogs you may have noticed a couple of things. First, I typically begin my analysis in the center. This is because a good mandala relates everything to the center. 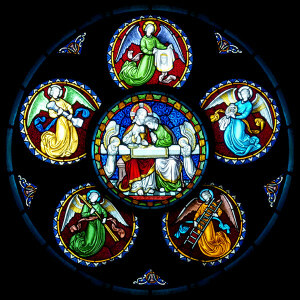 Second, Christ is often in the center. As I read scripture I often pencil out a mandala. Out of the 100s of mandalas I have drawn, Christ is found in the center over 80 percent to the time. This is where He belongs. The Saint Hubert mandala has a larger central circle showing Jesus during the last supper. The five smaller circles surrounding the main circle contain symbols associated with the Passion. Five is the number symbolic of the wounds that Jesus received on the cross. It is very appropriate for the subject matter of this window. Jesus offers a chalice and a piece of bread to a saint. Jesus again has a nimbus behind his head indicating divinity. Small angels are to his left and right. My guess is that the saint represented as seated at the table close to Jesus is the apostle John. As we move through the five outer circles I will identify the symbols and their relevance to the overall image. Most of the symbols are pretty obvious. Finally, I’ll give a short discussion of the winged Beings present with the symbols. Circle 1. Pillar. The pillar refers to the pillar to which Jesus was bound during the Flagellation and is symbolic of the Passion. Circle 2. Saint Veronica’s veil. According to tradition, Saint Veronica gave her veil to Jesus while he was carrying the cross to Golgotha so that he could wipe his forehead. After Jesus wiped His face with her veil, the imprint of His face remained on the cloth. Circle 3. Three nails and a crown of thorns. Both these elements are used as symbols of the Passion. Circle 4. A ladder is another symbol of the Passion. The tradition is that a ladder was used to bring Jesus’ body down from the Cross after he died. Circle 5. Spear and sponge on a reed. Again, these are common symbols associated with the Passion. The sponge at the end of a reed given to Jesus when he said “I thirst”, and the spear which was thrust into his side while he was on the cross. It is tempting to try to associate the various saints present during the course of the Passion with the symbols in the outer rings. Saint Veronica, Saint Longinus, the Mary’s and so on. However, I rarely see saints represented with wings. Sometimes John the Baptist is depicted with wings. Also the symbols for the four Evangelists have wings as we saw in the Stanford Mandala. I believe they are shown with wings because of their roles as divine messengers. For example, John at the table with Jesus is a saint. He is not depicted symbolically so he is given a halo, but is not given wings. Most likely the five winged beings in the outer circles are angels. Besides being messengers they also ministered Jesus. We find them ministering to Jesus in the wilderness and again later in the Garden of Gethsemane. The suggestion in the mandala is that angels ministered to Jesus throughout the Passion.